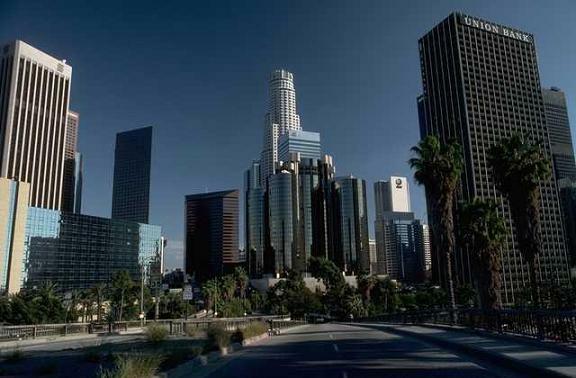 Los Angeles is the largest city in California, and the 2nd largest in the United States. As of 2006, the population was estimated by the state government as 10,245,672. Important education institutions in Los Angeles include the University of California, Los Angeles ("UCLA") and the University of Southern California. The University of California, Los Angeles ("UCLA") is one of the University of California's ten campuses. The University of Southern California is the state's oldest private research university. Sports teams in Los Angeles include the baseball team, the Los Angeles Dodgers, the NBA basketball team, the Los Angeles Clippers, the NBA basketball team, the Los Angeles Lakers, and the NHL ice hockey team, the Los Angeles Kings. Some of the leading companies with their headquarters in Los Angeles include Northrop Grumman, Occidental Petroleum and Paramount Pictures. Airports for Los Angeles include LA/Ontario International Airport (which is actually in Ontario) and Los Angeles International Airport. Los Angeles is one of only a handful of cities to have hosted the Summer Olympics more than once - in 1932 and 1984. Los Angeles has many nicknames including "The Big Orange", "City of Angels", "City of Flowers and Sunshine", "La-La Land", "Shaky Town", and "Tinseltown". 37 Los Angeles Attractions, Tours, Museums, Activities, Sites & More for 1 Low Price! Written by locals, Fodor’s Southern California is the perfect guidebook for those looking for insider tips to make the most out their visit to Los Angeles, San Diego, Santa Barbara, and beyond. Complete with detailed maps and concise descriptions, this Southern California travel guide will help you plan your trip with ease. •EXPANDED AND UP-TO-DATE COVERAGE: Includes an expanded chapter on Southern California's quintessential drives for those unforgettable roadtrips. From advice on how many days to stay at each destination to must-see stops along the way, this is an essential trip-planning tool. •GORGEOUS PHOTOS AND ILLUSTRATED FEATURES: Rich, full-color features on the San Diego Zoo, Hollywood, and more. •ITINERARIES AND TOP RECOMMENDATIONS: Multiple sample itineraries to help you plan each day and make the most of your time. The comprehensive itineraries cover the highlights of the region, such as Disneyland, Los Angeles, San Diego, and Palm Springs. Includes tips on where to eat, stay, and shop as well as information about nightlife, sports and the outdoors. “Fodor’s Choice” designates our best picks in every category. •INDISPENSABLE TRIP-PLANNING TOOLS: Each chapter opens with an orientation spread that includes a map, short descriptions of each region, and the Top Reasons to Go. Tips on surfing, traveling with kids, avoiding traffic, and more assist a wide range of travelers. •COVERS: Los Angeles, San Diego, Palm Springs, Big Sur, Orange County, Santa Barbara, Mojave Desert, Joshua Tree National Park, Death Valley National Park, and much more. Planning on visiting other destinations on the West Coast? Check out Fodor’s Northern California, Fodor’s Pacific Northwest, and Fodor’s Oregon. Fodor's Los Angeles keeps pace with this fast-changing cultural capital. With more than 45 million visitors each year, the City of Angels has it all, including unbeatable beaches, iconic theme parks and studios, stunning architecture, and world-class museums and concert halls. Planning on visiting the rest of California? Check out Fodor’s state-wide guide to California, Fodor’s Northern California, Fodor’s San Diego, Fodor’s Napa & Sonoma, and Fodor’s San Francisco. Probably more than any other major cultural metropolis, Los Angeles is a city for those in the know. A guide like no other, this is the first book to go beyond locations and events to tap into the variety of things only a local could know. The Best Things to Do in Los Angeles explores every aspect of Los Angeles life. Find the best spots to view the Hollywood sign or exactly where to catch postgame fireworks at Dodger Stadium. Track down the most authentic eateries in ethnic enclaves, and engage in L.A.’s legendary food wars, from hamburgers to French dips. Follow the most beautiful routes up and down the Pacific coast, take your own unique architectural tour of the Hollywood Hills, or find out where the city’s best bookstores are and read up on it all instead. Organized by theme – from destinations to views and sights, food and drink, and of course the Hollywood trail of superstar haunts and famous locations – and with contributions from celebrated Angelenos including, Gary Baseman, Flea, Ludo Lefebvre, Sasha Spielberg, and more, this is simply the most helpful and fun guidebook there is to the City of Angels. California is one of America's most popular vacation destinations--its diversity draws every type of traveler, from foodies to families. Fodor's full-color California guide covers all corners of the state, from the northern coast to Wine Country and from Los Angeles to Yosemite National Park. PULLOUT MAP: A handy take-along map provides added value, giving travelers essential information so they can travel with confidence. UP-TO-DATE COVERAGE: Travelers can road trip with ease with a chapter dedicated to California's quintessential drives, now with even more destinations covered. From advice on how many days to stay at each destination to must-see stops along the way, this is an essential trip-planning tool. New hotels and restaurants are also included throughout. ILLUSTRATED FEATURES: In-depth features detail popular attractions such as the San Diego Zoo, as well as Cable Cars and Chinatown in San Francisco. A must-have for wine buffs is the Wine Tasting in Napa and Sonoma feature, which suggests a tasting itinerary, teaches the proper wine tasting technique, and describes how grapes are grown, harvested, and pressed. INDISPENSABLE TRIP-PLANNING TOOLS: Top ¬Attractions and Top Experiences help readers choose activities based on their interests. For outdoorsy types, dedicated national parks chapters include planning tips and highlights. DISCERNING RECOMMENDATIONS: Fodor's California offers savvy advice and recommendations from local writers to help travelers make the most of their visit. Fodor's Choice designates our best picks in every category. COVERS: San Francisco, Los Angeles, San Diego, Palm Springs, Yosemite National Park, Big Sur, Napa and Sonoma, Monterey Bay, Lake Tahoe, Mendocino, and more. This newly updated pocket travel guide for LA will lead you straight to the best attractions this city has to offer, from famous Hollywood sites to the best comedy clubs, museums, and restaurants. • Brand-new itineraries help you plan your trip to Los Angeles. The perfect pocket-size travel companion: DK Eyewitness Travel Guide: Top 10 Los Angeles. Lonely Planet Los Angeles, San Diego & Southern California is your passport to the most relevant, up-to-date advice on what to see and skip, and what hidden discoveries await you. Experience the golden sands, epic surf and picturesque sunsets along the coast; absorb beautiful art, awe-inspiring architecture, and gorgeous views at iconic the Getty; or meet your favorite cartoon character in Disneyland; all with your trusted travel companion. Get to the heart of Los Angeles, San Diego & Southern California and begin your journey now! The Perfect Choice: Lonely Planet Los Angeles, San Diego & Southern California, our most comprehensive guide to Los Angeles, San Diego & Southern California, is perfect for both exploring top sights and taking roads less traveled. Looking for just the highlights of Los Angeles? Check out Pocket Los Angeles, a handy-sized guide focused on the can't-miss sights for a quick trip. Looking for more extensive coverage? Check out Lonely Planet's California guide for a comprehensive look at all the state has to offer, or Lonely Planet's Discover California, a photo-rich series guides, which focus on the state's most popular attractions. Authors: Written and researched by Lonely Planet, Sara Benson, Andrew Bender, and Adam Skolnick. Lonely Planet Los Angeles, San Diego & Southern California is your passport to all the most relevant and up-to-date advice on what to see, what to skip, and what hidden discoveries await you. Dive into a glittering Palm Springs pool, join the human parade at funky Venice Beach, or search tide pools for starfish in sunny San Diego; all with your trusted travel companion. Get to the heart of Los Angeles, San Diego, and Southern California and begin your journey now! The Perfect Choice: Lonely Planet Los Angeles, San Diego & Southern California, our most comprehensive guide to Los Angeles, San Diego, and Southern California, is perfect for those planning to both explore the top sights and take the road less traveled. Looking for just the highlights of Los Angeles? Check out Lonely Planet's Pocket Los Angeles, a handy-sized guide focused on the can't-miss sights for a quick trip. Looking for more extensive coverage? Check out Lonely Planet's California Travel Guide for a comprehensive look at all the state has to offer, or Lonely Planet's Discover California, a photo-rich guide to the state's most popular attractions. Ever dreamed of a fun family vacation and ended up with bored, complaining kids instead? NOW! Get the secret to a fun, relaxing and educational family trip in Los Angeles... Yes, with the kids! Los Angeles travel guide and activity book in one! Enjoy a new family adventure in Los Angeles, California. Watch as your kids become little experts about LA: the relevant history, what the city looks like, the transportation system, and many fun and fascinating facts about the city. Your little tour guide will take you through Los Angeles attractions: The Hollywood Boulevard, Santa Monica Pier, Aquarium of the Pacific, and of course, Los Angeles theme parks! From planning and packing to returning home. The Los Angeles guide and diary will become a souvenir of your travel that the whole family can treasure for a lifetime. You, the parents... All you need to do is to find an available bench and relax. And, of course, enjoy your vacation while you enjoy your active children. Your kids can discover even more cities and countries around the world with FREE downloadable activities, coloring pages, tips and special offers at theFlyingKids.com. Grab a copy of the most fun, educational, and interesting travel guide for kids and enjoy a new family adventure! AND… Enter your child in Leonardo’s weekly prize drawing! FlyingKids® makes your family travel more fun, enriching, and unforgettable.